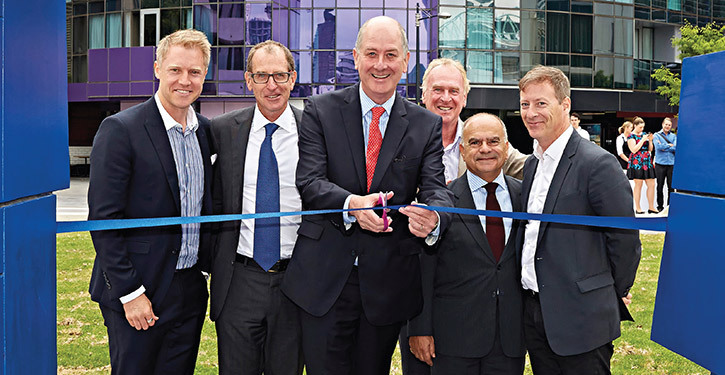 Australia’s first capital city public sculpture park, Monument Park, featuring the work of internationally-acclaimed Melbourne artist Callum Morton, was officially unveiled by The Hon Richard Wynne, Minister for Planning, and Andrew and Michael Buxton, founders of MAB Corporation, the company behind its creation on 10 December 2014. The $3.1 million Monument Park is MAB’s latest integrated art and landscape project at NewQuay, Docklands and is the first of six public spaces to be created in NewQuay over the next five years. Monument Park on NewQuay Promenade is a key step in revitalising the NewQuay Docklands precinct. What was once a concrete plaza which people used as a passageway is being transformed into a space for people to relax, grab a coffee and a bite to eat and enjoy life on the water at NewQuay. Monument Park is a collaborative project that unifies Australia’s prized designers: internationally-renowned artist Callum Morton, award-winning architects McBride Charles Ryan and landscape architects, Oculus. The project was funded by MAB Corporation and Places Victoria with the support of the City of Melbourne. “MAB’s vision is to establish a new benchmark for art, architecture and public spaces in Melbourne. Each member of our design team is a multi-award winner in their own field with whom we collaborated to create a unique space for NewQuay that we are extremely proud of,” said Andrew Buxton, MAB Managing Director. Monument Park has been designed to complement the distinctive architecture of The Quays apartment project which has been acknowledged with 11 awards within the property, architecture and design industries. “Monument Park offers an outdoor space for locals and visitors alike, with a variety of places to inhabit â€“ in the sculptures, on the lawn, by the water or at a local cafÃ©,” said Mr Buxton. According to Mr Buxton, Monument Park has set a new benchmark for art in public spaces and would help place national and international attention on NewQuay, Docklands – an important extension to the City of Melbourne. MAB has a unique approach to integrating art in its landscaping, encouraging people to interact with the art rather than simply observing. This is an approach that has proven successful in previous MAB art projects including ‘Silence’ and ‘Meeting 1’, both on NewQuay Promenade. Artist Callum Morton said that key elements of the design included the use the Hoddle Plan of Melbourne and various city monuments to create a magical space based on the city it inhabits. “Critically we wanted to emphasise the idea that Docklands should be regarded not as an isolated precinct but rather as an extension, and integral part of the City of Melbourne proper. “The ground plane is imagined as a concrete carpet derived from the original Hoddle Plan that is draped across the site, rising and falling as it covers an arrangement of objects under its surface. NewQuay has evolved significantly in recent months, from welcoming new residents to The Quays through to the creation of Monument Park as well as introducing several exciting new businesses. In 2015, NewQuay will continue to progress with the completion of the Ron Barassi Senior Park – Melbourne’s newest park and sporting facility in Docklands.